“Location” Replaces “GPS” in Android KitKat: Annoyingly, Not One, but TWO Consent Screens! A couple of weeks ago, I had some trouble going on with my location-based services on my Android phone. Now, I’ve occasionally been having some issues with my GPS while driving (which is incredibly frustrating! ), but it became a serious problem all of sudden and I couldn’t figure it out. I then realized that I had recently updated my system and that – in lieu of the “GPS” setting, it had now become “Location”. Okay, just a difference in name, right? Then, if you don’t press “Agree” or if you do press “Disagree”, then you can’t use Location. If you press “Agree”, up pops a second “Location consent” notification. Really? The first one wasn’t sufficient?! 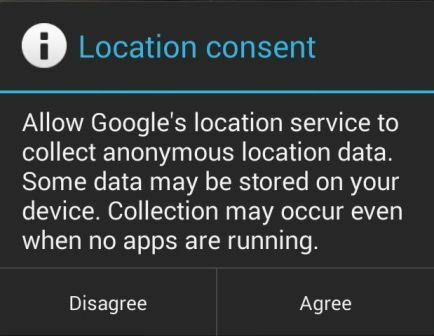 It reads: “Allow Google’s location service to collect anonymous data. Some data may be stored on your device. Collection may occur even when no apps are running.” Well, thanks. If you press “Agree”, then you get to use the location services. If you press “Disagree”, not only can’t you use the location services, but also “Location” is still on for battery-draining…. Another annoying aspect is that whereas previously, one could leave “GPS” off and check in, using Foursquare, for instance, merely by wi-fi. Now, that is no longer an option if “Location” is off. A further annoying aspect is that the second “Location consent” notification doesn’t always immediately pop up. So, if, for instance, you just want to quickly check in somewhere using a location-based service (e.g. Foursquare, Yelp, Facebook, etc. ), you have to wait until that notification pops up. 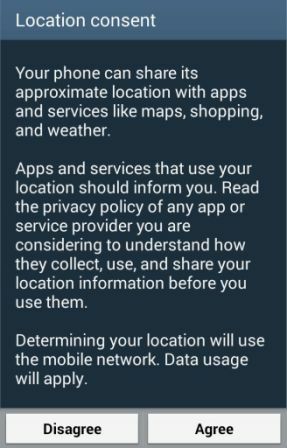 Also, sometimes you may want to get back to the home screen – well, that pushes down this second “Location consent” and you lose your opportunity to agree to it; you end up having to turn off “Location”, turn it back on, agree to the first “Location consent”, then wait again for the second “Location consent”. Remember when you only had to tap “GPS” to turn it on to get your location? The last annoying thing (of which I can think as of now) about the new “Location consent”s is that there is no option presented to the user of always agreeing or of never having to see those “Location consent” notifications again. So, it’s always a three-tap process and you don’t know how long you have to wait for that second “Location consent” notification to pop up. There is significantly more time involved with this new “Location” process. I am hoping that this process is temporary and that Android gets their act together and makes it easier once again to get one’s GPS operable.